Zach Kirkhorn landed his first job out of school with McKinsey & Co. and joined Tesla Inc. (TSLA.O) while still in his mid-20s. He’s now about to take over a finance department that’s been through months of tumult. Kirkhorn, 34, will become chief financial officer of the electric-car maker after a few months more grooming by his predecessor, Deepak Ahuja. Chief Executive Officer Elon Musk revealed the shakeup in the closing minutes of Tesla’s earnings called Wednesday, and the surprise announcement sent the shares tumbling as much as 5.9 per cent. Tesla saw a wave of executive departures in 2018 that hit the finance team particularly hard. Chief Accounting Officer Dave Morton resigned in September after less than a month. Justin McAnear, vice president of worldwide finance, left in October. Ahuja, 56, retired in 2015 but returned in 2017 when his successor, Jason Wheeler, announced he’d quit after just 15 months. He plans to go back into retirement after a few months and continue to serve as a senior adviser, probably for several years, according to Musk. In a tweet, the billionaire thanked the retiring executive and wished him happiness. The CEO joked on the call that he didn’t think the few years Kirkhorn spent at Harvard Business School were necessary (he earned his MBA in 2013). While he’ll rank among the youngest CFOs at major U.S. companies, he has a few years on David Knopf, who took over the role for Kraft Heinz Co. at 29 in 2017. 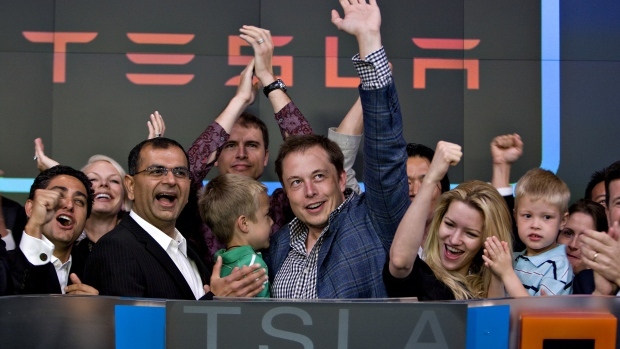 Tesla shares ended 3.8 per cent higher on Wednesday, gaining the most in three weeks. Those gains reversed in extended trading after the earnings and CFO announcements. The stock was down 5.1 per cent to US$293 early Thursday in New York. While the company came up short of analysts’ estimates for fourth-quarter profit, it posted US$910 million in free cash flow. Musk also assured investors Tesla will be able to “comfortably” pay off a US$920 million convertible bond maturing in March.